1) A link to an Eventbrite ticket page will be posted on the official KINGDOM HEARTS Facebook page on Tuesdays at 1:00pm (PST). Tickets will be very limited, and will go very quickly! 2) Pre-order the KINGDOM HEARTS HD 2.5 ReMIX Collector’s Edition by November 18 to be automatically entered into the “Inside the Kingdom, from the Heart” Sweepstakes and 100 lucky winners will receive tickets! Pre-order here. 3) Simply answer the following question by responding in the comments section below by November 18th and we’ll select 25 people to receive tickets! Take part in the festivities everyone! Kingdom Hearts HD 2.5 ReMIX makes its North American debut in 21 days and European debut in 23 days. 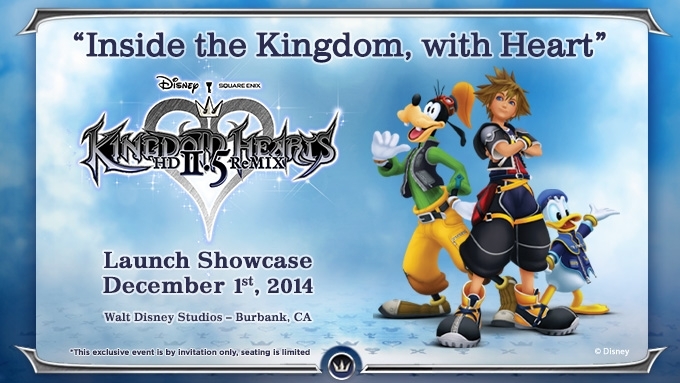 Stay tuned for more details on this upcoming event, here on KH Recharged.